Remove chops from bag, dicarding marinade, and grill over a medium-hot fire, turning once, until just done, about 8 to 11 minutes total cooking time. 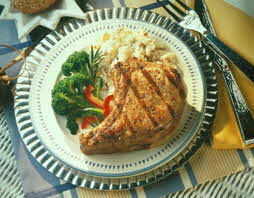 An easy way to marinade your pork chops. Serve with sliced tomatoes in vinegrette, broccoli spears and garlic mashed potatoes.